MindTouch DekiWiki (later MindTouch Core) was an amazing wiki for its time. Even now, years after it went out of support, I couldn’t name an equivalent with strictly hierarchical pages and a user-friendly rich text editor. Once upon a time it was available for free as a community edition, up until MindTouch changed their business model. Unfortunately by then it had been enthusiastically adopted by a bunch of people and as the years drag on those people have been looking at their out-of-date Deki installations and wondering what to do. I recently had to deal with one of them. It has a hierarchy like Deki: a page can be a child of another page and this shows up in the left navigation menu. However all page titles live in a global namespace, which means that some work is required to avoid collisions. 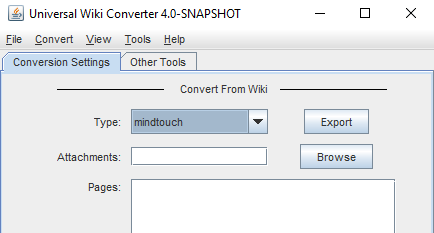 There is an old open source Universal Wiki Converter for Confluence that includes a MindTouch exporter. It doesn’t appear to have been worked on for years and it has showstopper bugs. Once I fixed those it does provide an automatic process for exporting and importing a Deki that could scale to arbitrary sizes. In fact, this was the only good solution I could come up with. Without the Confluence UWC I would have been stuck trying to get the data out myself and it would have been horrific. In this post I want to point out all the challenges I hit along the way and what I did to get around them. Unfortunately the UWC is not under a defined open source licence so I don’t really want to publish a “fixed” JAR in case someone sends in the lawyers. However I’ll take my chances sharing a patch that you can apply to the repo yourself and rebuild. Run the Export process. At the end, your PC has a folder containing a hierarchy of XML files and their associated attachments. In the rest of this post I will describe each of these items in detail. For this task I used the Oracle Java 8 SDK and Eclipse on Windows 10. Download and install if them if you don’t have them already. Make sure Java is in your path and runs the correct version from the command prompt. I am assuming for this example that you have git installed on Windows, either directly or through WSL, both for cloning the code and to apply the code patch that comes in a later step. When I searched for migration tools, I located the UWC on the Atlassian Migrations wiki. It hasn’t had much love for a while but the docs are still relevant. Note that if you follow the links you end up on an ancient download page which I couldn’t get to work at all. Instead I found this appfusions repo which was last touched in September 2016. This is much newer and I was able to get it to work with some fiddling. The first step is to clone this repo somewhere on your computer. Here I’m using the bash shell in Ubuntu WSL. remote: Counting objects: 3389, done. remote: Compressing objects: 100% (1873/1873), done. Receiving objects: 100% (3389/3389), 8.74 MiB | 1.89 MiB/s, done. Resolving deltas: 100% (1371/1371), done. Checking out files: 100% (1734/1734), done. The presence of a build.xml file in the root indicates that this uses the Ant build system. 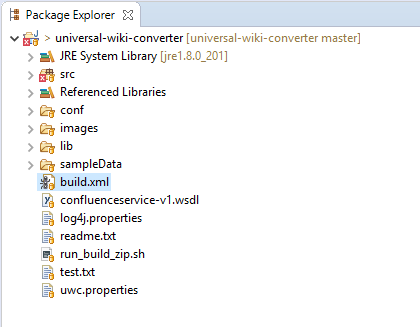 After the import you should see the files under Package Explorer, including build.xml. To build it, right click on build.xml and select Run As > Ant Build. It will probably fail at this point, but after the fixes are applied you will hopefully see a successful build reported in the console at the bottom of the window. The project is configured to place the compiled software and all supporting files in the target/uwc subdirectory. Warning: All the template config files are copied over on every build! If you edit them inside the target directory, they will be reset to defaults if you run the Ant build again. Either save those files, or copy the target folder somewhere else while you run it. Four main problems came up which required changes to the UWC code. I’m going to briefly explain them here but it’s not really important. Download this patch file and see instructions below about how to apply the fixes. Some type definitions have changed in newer versions of Java, which means names in the existing code are ambiguous and need to be specified more clearly. UWC authenticates to the Deki using HTTP Basic Authentication. There is code in UWC that looks like it should respond to a Basic Auth challenge, but in practice it simply doesn’t. As a result you get unauthorised errors and nothing exports. Other Java programmers have come across the same problem and one reliable fix is to create the authentication header manually, so that’s what I did. The final problem is that certain XML parsing errors throw a RuntimeException, which terminates the entire export process. If you have messed-up markup in your pages—which is easy to do if you copy random content from the web into Deki’s editor—it’s preferable to just keep going and patch them all up at the end. As shown a little later, it is possible to identify the affected articles from the log. They were never going to work automatically anyway so I don’t consider this a big deal. Hopefully you won’t run into any more code problems, but if you do, you now have an IDE ready to go for debugging. Hopefully it will run and a GUI will pop up. If you like, you could create a file named uwc.bat and place that command in it to make this easier to run. Now that UWC is up and running, close it again. It’s time to change the configuration files under the conf/ subdirectory. This is actually pretty well documented on the Atlassian Migrations wiki and you should take the time to read that page. You need to review the two files exporter.mindtouch.properties and converter.mindtouch.properties. Here I will point out which lines I changed. You may need more. The URL of the Deki I am exporting. I didn’t use a trailing slash. The credentials for the Deki administrator that will download all the content. A relative path where the exported files should be placed on the local machine. Here I used a trailing backslash since I’m on Windows. Ensure you create this folder yourself. I had to set this to false. I’m not sure if this would apply to everybody. With the default value of true, it ignored the root of my deki and zero pages were exported. The exporter will save its stuff into the subdirectory tmp\exported_mindtouch_pages. Include the full path on the filesystem with no trailing backslash. Set the exportdir property to the exact same path. It can be helpful to change the log4j.properties file to show much more information about what’s going on, especially if you encounter problems beyond those that I’ve described here. Edit that file in a text editor and change #log4j.logger.com.atlassian.uwc=DEBUG so it doesn’t have the # at the beginning. This gives you a nice medium level of output and I would recommend it. If you are stuck on a more serious problem, change log4j.rootCategory=INFO, A1, A2 to log4j.rootCategory=DEBUG, A1, A2. This will make everything extremely verbose. While UWC is running it will both log to the command prompt and also to the file uwc.log. You can safely delete it after closing the program. I would recommend that you delete it between each major step—i.e., do the export, copy out uwc.log and name it the “export log”, delete it, do the convert, copy out uwc.log and name it the “convert log”. You will need to review these files later on and it’s easier to make sense of it if they’re separate. In fact, it doesn’t need to be an admin. You just need a user with sufficient privileges to see all the data. This goes into the user and pass config variables mentioned earlier. Note that the UWC does not support exporting the user pages—the ones you see when you click on a username. That’s because they aren’t included in the sitemap API that lists all pages. If you want those, copying them out is left as an exercise for the reader. The actual export is extremely straightforward once all the prerequisites are in place. Run UWC and choose mindtouch from the drop-down box at the top of the screen. It will pop up a progress dialog but also show more information on the command prompt, especially if you changed uwc to DEBUG logging in log4j.properties. It will download the pages, tags, comments, attachments and write everything to the output subdirectory tmp\. Even if you want to mix your data into an existing space, I’d recommend creating a temporary space first while you experiment with the process. Spaces are easy to delete and recreate until you’re happy with the result. When you create a space you give it a human-readable name and also a Space Key, which is the bit that appears in the Confluence URL. This Space Key is how you tell UWC where to upload your pages. While “converting” (i.e. uploading) to Confluence I kept running into strange problems where I’d upload a big attachment and UWC would freeze forever. After investigating the logs on on the server side I realised that it was actually caused by Confluence running out of heap space. For reasons I don’t fully understand, uploading a ~150 MB attachment required several gigabytes of heap memory. I ended up giving it 4 GB by following their instructions. In the administrator settings you will need to make two changes. You will need to provide UWC with the username and password of an account that can create pages and upload attachments in the Space. By the time the export finished it should have created a subdirectory called tmp\exported_mindtouch_pages. This is the one you need. Cycle your log files and re-run UWC. Leave Attachments set to blank. Under Pages, click the Add button. A file browser will pop up. Navigate to that tmp\exported_mindtouch_pages folder and select it. The full path of the folder will be added to the list as a single entry. This looks weird, but it’s what the Mindtouch converter expects. 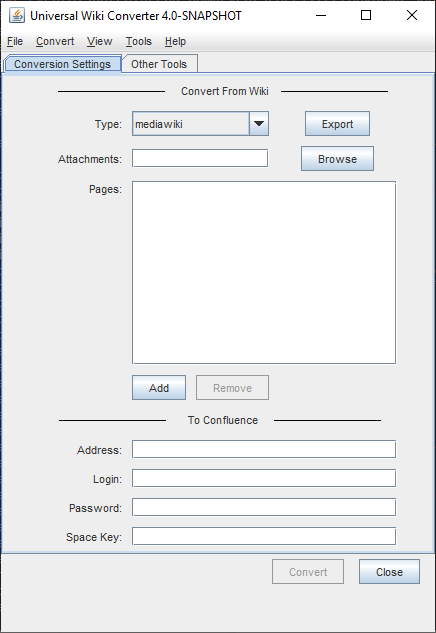 Under the To Confluence section, add the URL of the confluence instance such as http://something:8090/, the username and password of the uploading account, and the Space Key where the pages will be uploaded. Again a long process will occur, with most of the interesting output taking place in the command prompt. Make sure you save the uwc.log log file from this part too. 2019-03-05 10:14:56,807 ERROR [Thread-4] - REMOTE_API_ERROR: Could not transform wiki content in page: 'Page Name' from markup to xhtml. In these situations, the page will probably be created but it will contain the raw XML Deki source or have other problems with the content. The easiest fix is to update it manually: locate the page on both Deki and Confluence, select the Deki page text and copy/paste it into the rich text editor on Confluence. As you can see, both errors are shown near the name of the affected page so it’s possible to go through the log file and make a list. In practice this will probably be a minority of pages—in my experience it’s happened where people have copy/pasted weird HTML content directly from a webpage into Deki, where it saved it verbatim. Warning: Attachments/comments may not have come across either, so check those manually. If you see any lines like these it is extremely likely that only one of the pages has been created on Confluence. The trouble is that Confluence doesn’t support having two pages in the same space with the same title. In DekiWiki this is okay provided they are located under different parents. If the number is small you could just check all the pages manually (the paths in the error message indicate where they are in the tree) and recreate those that are missing. Again, don’t forget about any attachments! 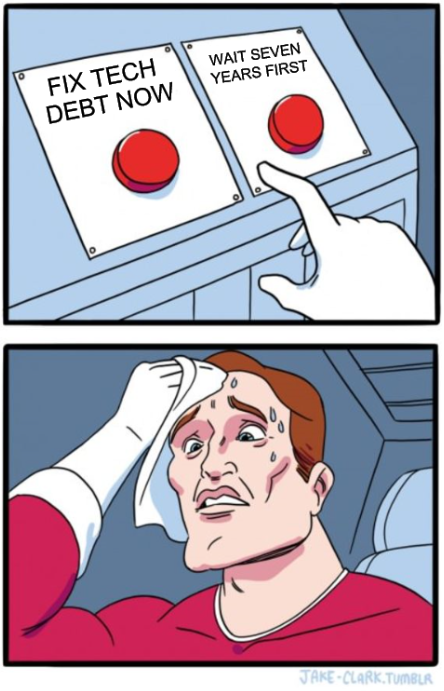 There were two final issues in my migration that I fixed manually. The root of my Deki was created as a child of the Space root. As a result, the Confluence left menu had only one item and I needed to click on it to see any of the children. It may be possible to fix this in the convert process but I just repaired it manually—I went to each of the second-level pages and moved them so the Space root was their parent. I then copied the page content of the imported root to the Space root then deleted it. Also, a handful of pages were at the root instead of at the correct place in the hierarchy. I’m not entirely sure what went wrong. I moved them back to the correct parent. Good luck. I’m sorry that you had to read this. If you have any further questions I probably can’t help you.